In February of 2011, NASA launched Robonaut 2 to the International Space Station. It was a huge achievement for the robotics team at NASA’s Johnson Space Center in Houston. 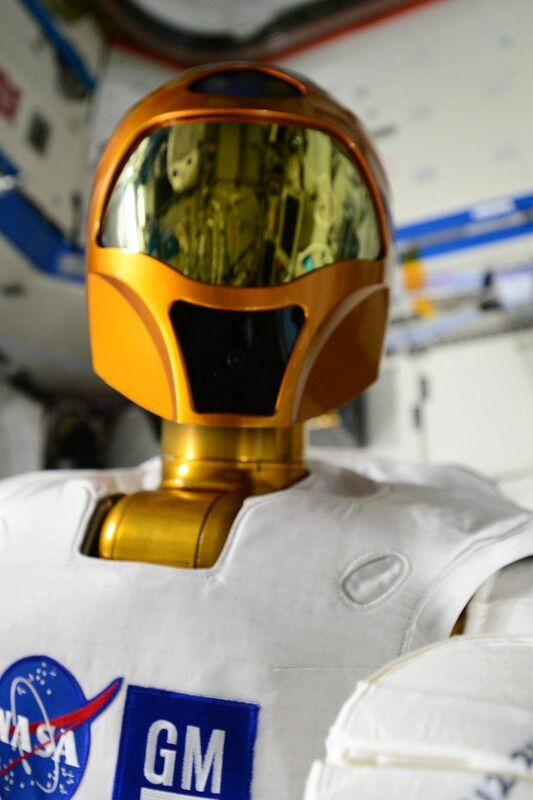 There had been other robots in space, but Robonaut was the first advanced humanoid to ever go on a mission beyond Earth. On board the ISS, the robot was intended to eventually work side by side with astronauts, performing some of the dull and repetitive tasks that take up a significant amount of time that the humans on the station could instead be spending on science and discovery. But in 2014, NASA decided to go forward with a complex and risky upgrade. The Robonaut sent to the ISS was a torso with a pair of arms and head, and now NASA wanted to add a pair of legs. The idea was to give Robonaut more mobility inside the station. The elongated, wiggly legs would work almost as a secondary pair of arms, allowing the robot to move itself around the station by holding on to hand rails, significantly adding to its capability. The hardware upgrade, however, didn’t go according to plan, and repeated attempts to fix a persistent problem have failed. 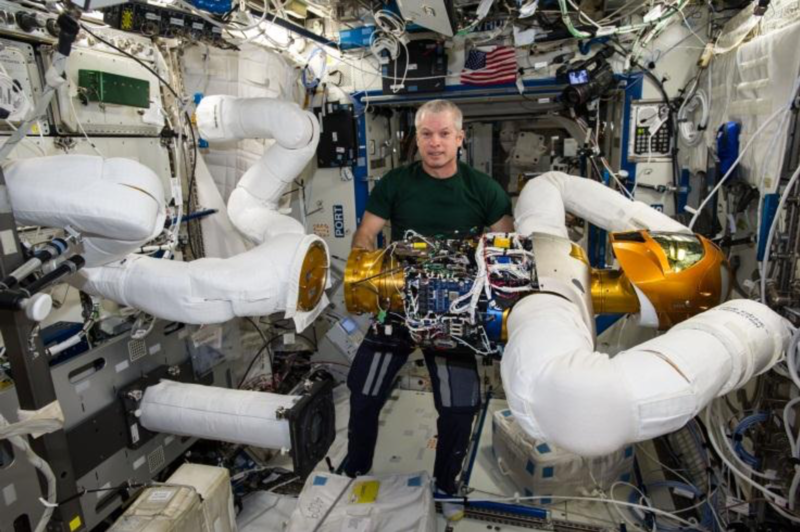 For the last several years, Robonaut has been almost entirely disabled, and publicly available ISS status reports show that the last time the robot completed a full research task was December of 2013. 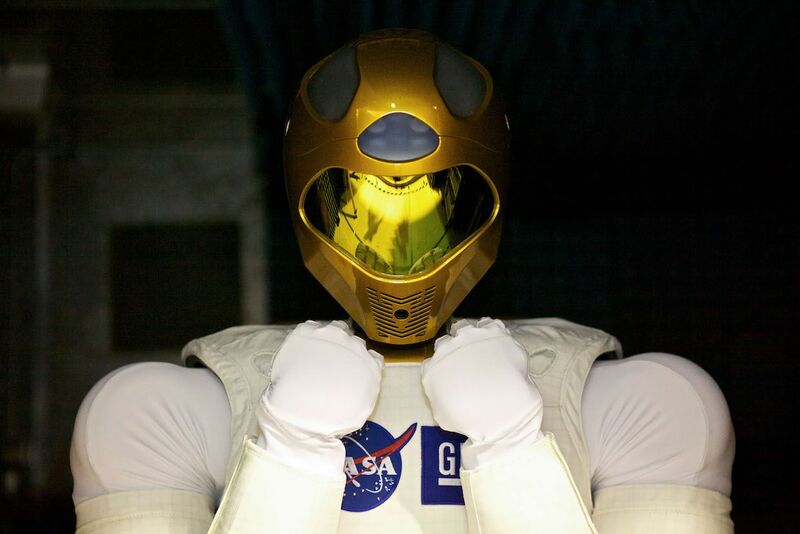 This week, NASA announced that it is bringing Robonaut back to Earth to be fixed. Robonaut at its task board in January of 2013. 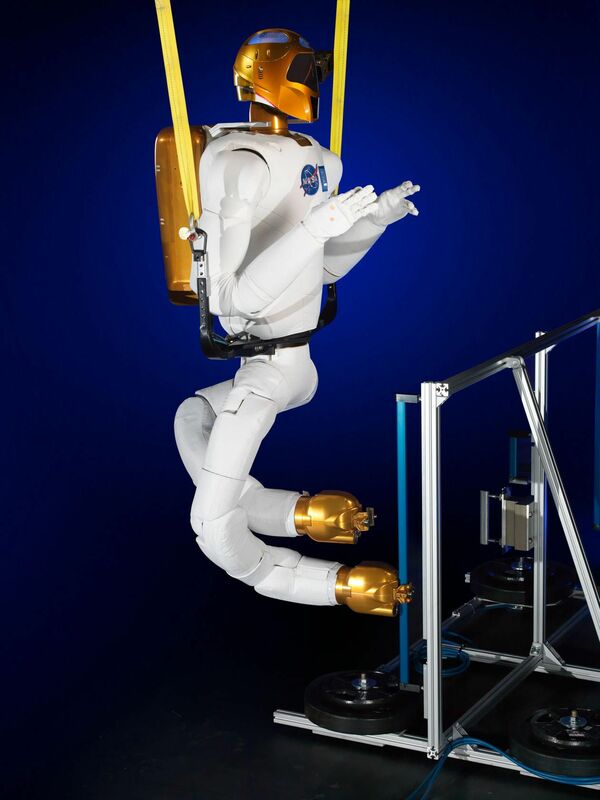 The decision to give Robonaut mobility had always been part of NASA’s long-term plan for the robot. NASA originally intended for there to be three distinct phases of Robonaut operations. The first phase involved stationary operations, and was completed successfully by the end of 2013 using the Robonaut torso. Phase II was “IVA Mobility,” where IVA stands for “intravehicular.” For this phase, Robonaut needed a way to move around the inside of the ISS, which is where the legs came in. The legs would also be key for Phase III, “EVA Mobility,” which would involve working in vacuum outside of the station, although this scenario would have required even more major hardware upgrades to the robot. Even for NASA, the leg upgrade was ambitious. Asked if the team was confident it would work, Badger said: “I definitely don’t think we were confident. The ISS basically is about trying new things, so we learned a lot from developing those procedures and having the astronauts run through that complex surgery.” She added that the crew members “did an outstanding job” and that the problem with the robot didn’t involve what the astronauts did, but derived from the complexities of the hardware. Robonaut undergoing surgery on the ISS. NASA expected that the leg upgrade, which took the Robonaut team 14 hours to do on Earth, would take the astronauts about 20 hours to complete. It ended up taking about 40. The work began on July 16, 2014, and was completed and called successful on August 28. 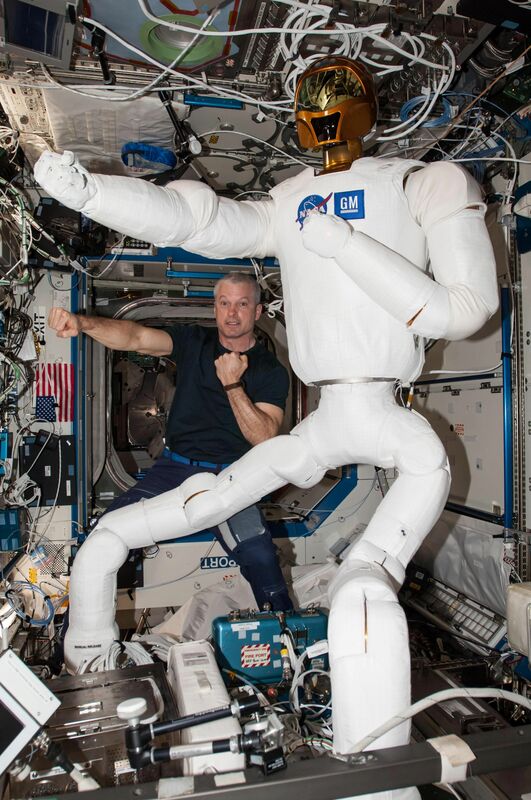 Astronaut Steve Swanson with Robonaut in 2014, after finishing the leg upgrade. 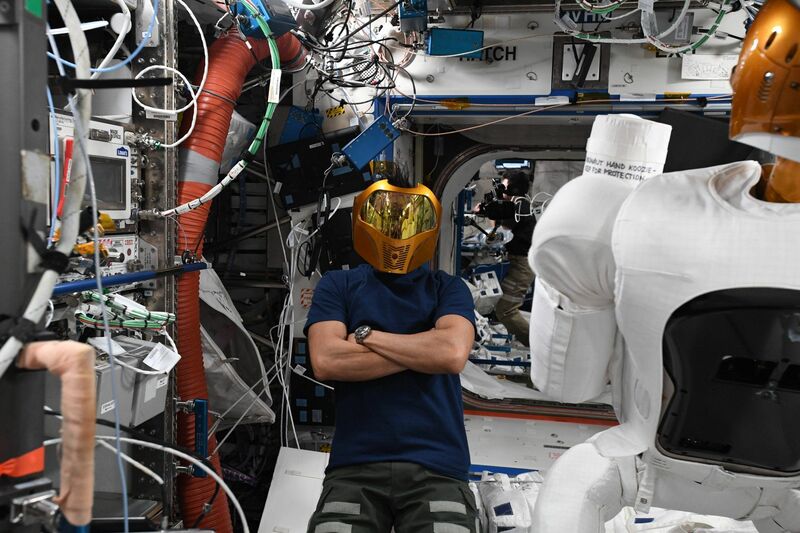 Almost immediately the Robonaut team at JSC realized something was wrong. On August 29, the robot was partially powered up, but they weren’t able to see any telemetry on the ground. Not long after, a loose wire was fixed and the robot passed intermediary checkouts, but during the next operation on December 17 (the first time motor power was applied to Robonaut after the upgrade), the legs wouldn’t move. The ISS daily summary reports provide a glimpse into how much both the astronauts on the station and the Robonaut team on the ground were struggling to understand what was going wrong with the robot. 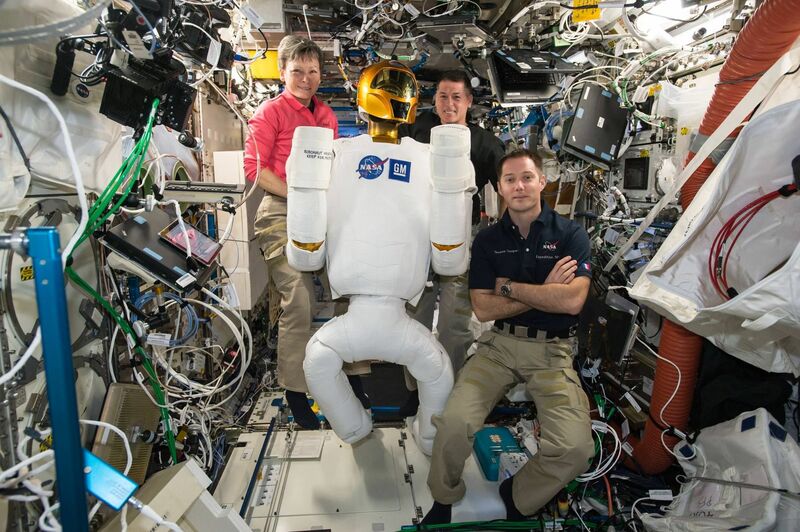 By 2016, it seems as though Robonaut was being taken apart and analyzed almost piece by piece. [Astronaut Tim] Kopra set up a camcorder to capture standard definition video downlinks of Robonaut operations in the US Lab. He used the oscilloscope, multimeter and current probe to help guide ground teams with this troubleshooting by disengaging the controller card and successfully powering Robonaut without the controller card. The data collected from today’s activity will be analyzed by the ground to determine the cause of the fault in the power supply. The crew performed troubleshooting on the Robonaut chassis. Previous troubleshooting suggested an issue with two card[s] that were returned and tested on the ground. The cards brought down were exonerated and during today’s activities teams received a good response from the Robonaut during first power up. Indicator lights were as expected for a working Robonaut. Various power cycles were performed while trying to narrow down intermittent fault statuses. Eventually the team exonerated several of the cables. The cards were not removed from the CPCI [Compact Peripheral Component Interconnect] chassis and remain installed and all cables were left connected. Teams plan to analyze results to develop any forward actions. It may seem surprising that NASA’s robotics experts weren’t able to diagnose and fix the problem more quickly, since space hardware is painstakingly designed, built, and tested before going into space. But the ISS Robonaut that the astronauts were working on is slightly different from the other five Robonauts at JSC. The space station Robonaut is an R2-B model, while the robots on Earth are R2-Cs, a later version that is “a fairly significant iteration of design,” according to Badger. In the end, she said these differences finally provided the answer, years after the problem first appeared. Astronauts Peggy Whitson, Shane Kimbrough, and Thomas Pasquet troubleshooting Robonaut on 2/1/17. What this meant is that electrical current wasn’t flowing the way it should through Robonaut’s body. It’s possible that some of its circuits and processors were getting no power at all while other components were essentially getting fried by too much current. The fault was slowly killing Robonaut. It’s this other damage that is the most concerning. Even if the original grounding issue has been solved, and the Robonaut team isn’t sure it has been, Robonaut is almost certainly suffering from significant degradation caused by current running unchecked through its computer chassis. There were some additional things the team could have tried, but when NASA asked if they wanted to use some free cargo space on the return flight of an upcoming resupply mission to bring Robonaut home, the team said yes. Depending on how much damage they find, the plan is to either repair the ISS Robonaut and send it back up to the station, or swap it for one of the R2-C units at JSC and send that one up instead. Last Friday, Robonaut was packed up to get it ready to come back to earth. As the team in Houston prepares to get their robot back in shape, Badger reminds us that it’s important to keep the overall Robonaut mission in context.